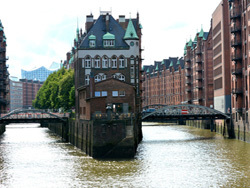 Hamburg is a beautiful historic port, but also a modern, thriving, city. 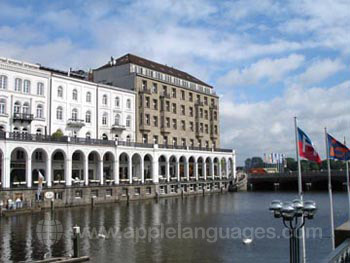 This is a city of canals, parks, waterfront pubs and beautiful buildings. 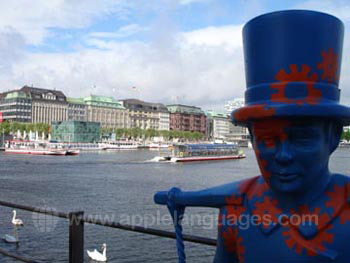 Though Hamburg is an international port and commercial city, it is also a city of culture and elegance, with opera, ballet, numerous theatres, medieval churches and museums. 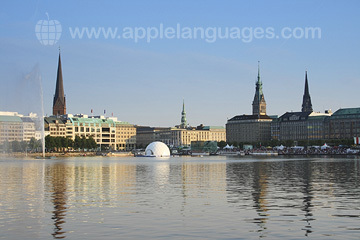 With 1.7 million inhabitants, Hamburg is a wonderful location in which to learn German, a city where there is always something new to see and do, always a new part of the city to explore. 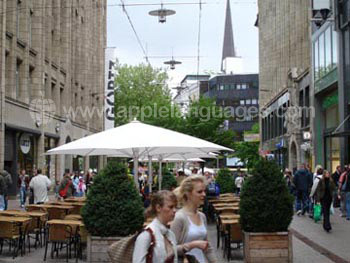 Our German language school in Hamburg is located right in the centre of the city in a quiet pedestrianized street, lined with trees. 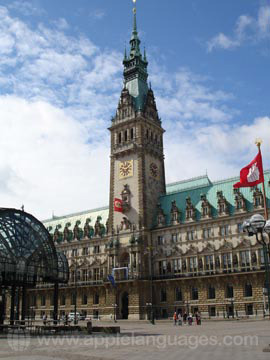 The area is brimming with shops, cafes and restaurants and is ideally located for exploring the rest of Hamburg! 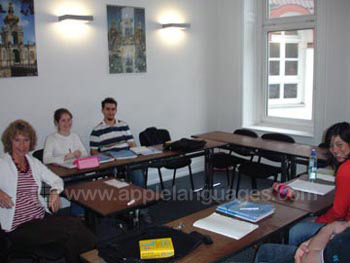 The school is one of the biggest in Germany and is comprised of 80 classrooms, as well as a comfortable on-site student residence which is located in the same building as the school. 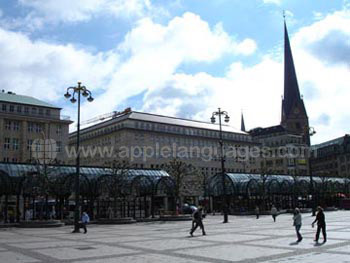 You can learn German on a Super-Intensive German language course of just 25 lessons each week, which can be taken either in the mornings or in the afternoons, depending upon your preference. 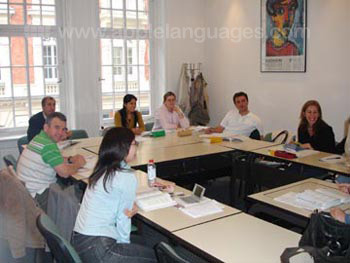 Each lesson is 45 minutes in duration and there is a maximum of 15 students in each group. Our Hamburg school also offers Super-Intensive + Private Lessons courses, which combine 25 group lessons with 5 additional private lessons per week and take place in the mornings or in the afternoons. For a completely personalised programme, choose a course of Private Lessons only. This is a great option if you have specific requirements or areas that you wish to improve. 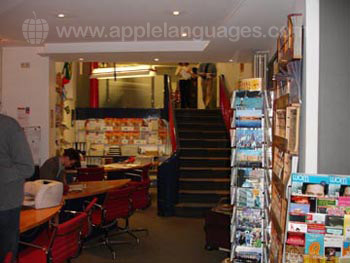 If you are preparing for the TestDaF examination, our school offers an Exam Preparation Course which will allow you to revise for this specific examination with the help of fully qualified and professional German teachers. 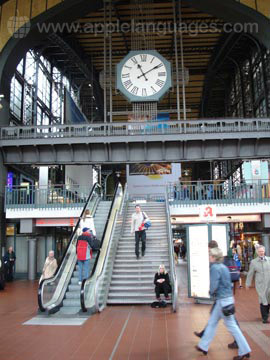 If you are staying in Hamburg for a duration of 3 weeks or less, you can stay with a carefully selected German host family, where you can choose between room only, bed and breakfast or half-board options. 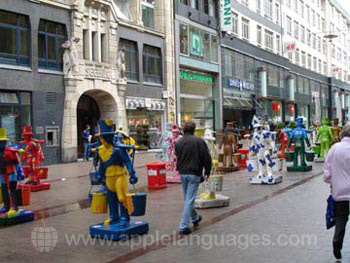 Staying with a German host family is an excellent way to learn German, as well as come to a better understanding of German culture and the German way of life. 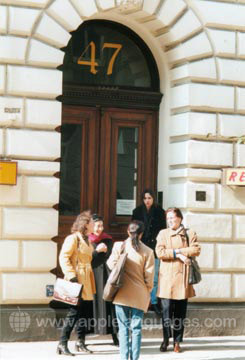 If your stay exceeds 3 weeks you stay in the school’s own student residence, which is located on site. 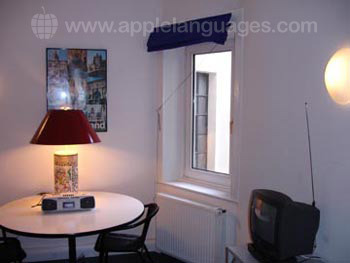 Each room has a TV and Wi-Fi access. There are bathrooms on each floor, but no kitchen facilities. 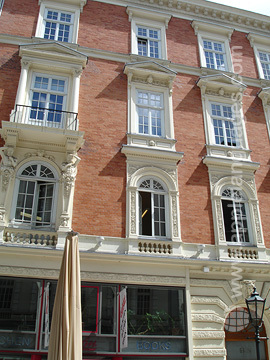 This on-site student residence is a very popular choice for anyone looking for reasonably priced but comfortable student accommodation, right in the centre of Hamburg! 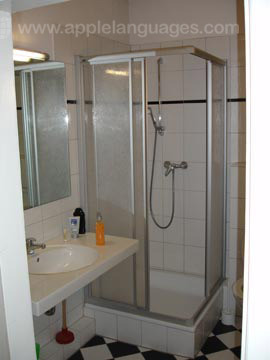 If you are looking to stay with other students or locals during your time in Hamburg, opt for a shared apartment. 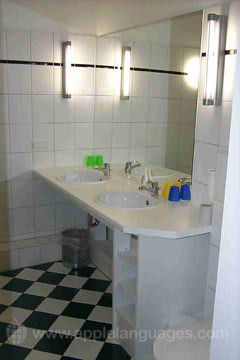 Apartments are comprised of private single bedrooms with communcal kitchen and bathroom facilities. 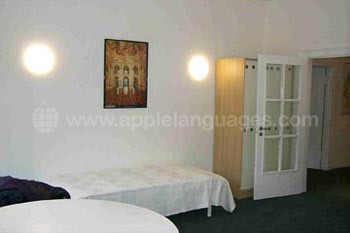 Each room is equipped with a chair, table, bed and wardrobe. We can also arrange studio apartments for anyone aged 18-35 who would like independent accommodation right in the city centre. 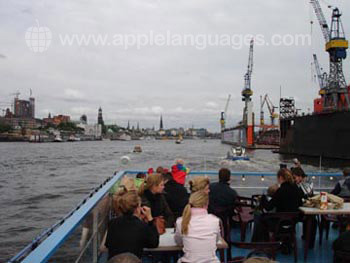 Our Hamburg school offers an extensive cultural program, including sightseeing tours around Hamburg (Harbour tour, Canal trip, Alster Round trip), visits to local companies (Hamburg Brewery, TV and Radio stations), museum visits and sports activities. 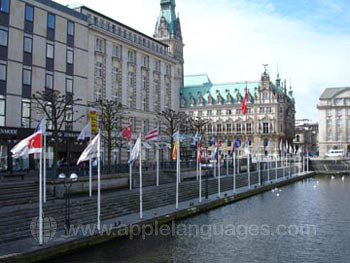 They even arrange full-day excursions on the weekends to other cities in Germany, such as Berlin, Lubeck, Travemunde, Schwerin, and many others! 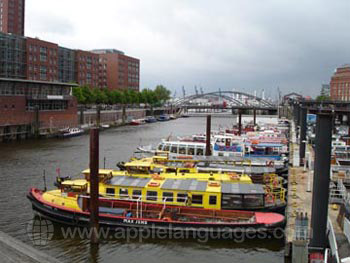 There are two airports in Hamburg: Hamburg-Fuhlsbuttel, the main airport in the city, and Hamburg-Lubeck. Our school can arrange for you to be met at on arrival at the airport and taken to your accommodation at an additional cost. Please contact us for more information. Average score for our school in Hamburg based on 46 previous client reviews. The teachers (Steffi and Angelika) are passionate and professional; The intensive course has a big impact because the teachers have the time to correct our mistakes. There are many opportunities for talks. My hostess was wonderful and caring. She has a nice apartment by the river, and the area is super cool. 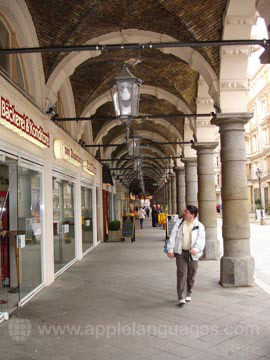 There are many restaurants, cafes, boutiques and bakery. 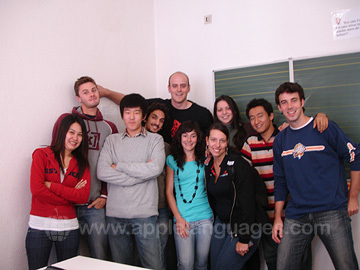 Small classes, personal attention, relaxed atmosphere, competent teachers, fellow-students from all over the world. 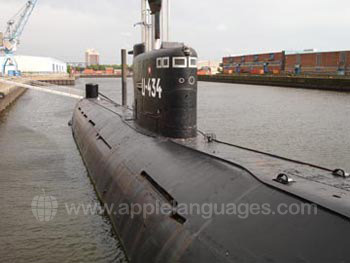 Great kick start into the language. Good to stay in Hamburg city & practice. Course content was good and challenging. Tutors were friendly & helpful. 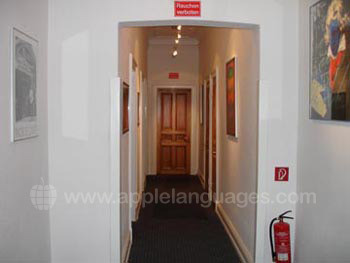 School is in a good location with easy access via train from the airport. 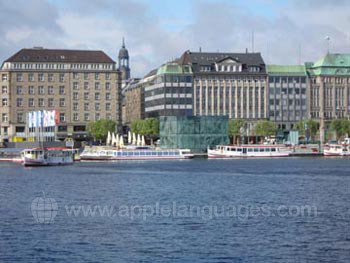 I took the Intensive Course (25h/week) in Hamburg. The teachers (Amelie and Philip) are super good: completely different teaching style made the class never boring and you can really learn! 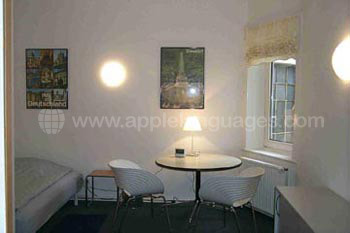 The studio apartment was located behind the main station. 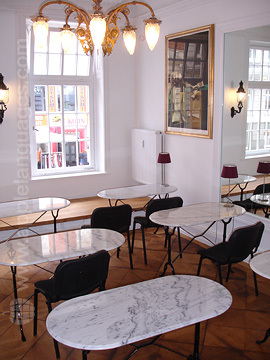 The location is very good and the quality of the room is high: new furniture, everything working as expected. Overall, I was very happy with the teachers at the school. I also found the weekend/afternoon excursions to be very useful. They were well organized. 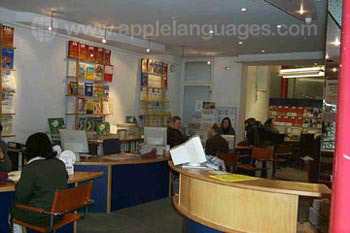 I am satisfied with the Colon Language School in general. Course was very good. Very well structured as we followed along with a textbook. All teachers were very good and had their own style of teaching. It was very refreshing to have lots of different teachers as it kept things interesting and new. 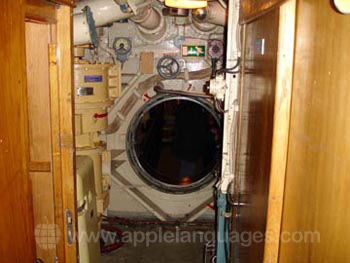 Had so much practice with speaking too, since everyone in the class spoke German to each other. My German has gotten much better and I am more confident speaking it than before. My accommodation was faultless. Frau Esser was so welcoming and lovely. She made sure I felt totally at home, spoke German with me all the time, and gave me my space when I wanted it, which was great. To get to the school it was only a short bus ride to the city and a 5-10 minute walk from that stop to the school. Loved it. We were placed in the wrong class initially [at the wrong level] but that was rectified on day one. Marlies was the perfect host in the perfect home. Teachers are patient and focussed - the quality and speed of learning are exceptional. Accommodation was perfect for me - bed-sit style private apartment, very close to the railway station, free secure parking for bicycles, very fast free wifi, laundry in basement. The quality of teaching at the school in Hamburg is very high indeed. Strongly recommended. Its was fun and i learned a lot in 1 week. Accommodation was perfect. I felt at home form the first day. I had a lot of freedom. Teachers excellent, course excellent. In particular my host family were 'stars'. 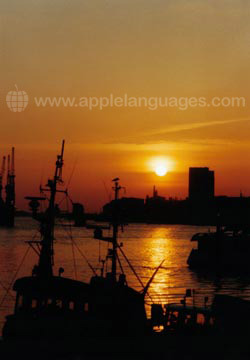 Very pleasent and helpful with German conversation in the morning and evening. The course were good and entertaining. I did not feel like I sat through so many hours per day, which is a good thing. It went by too fast. 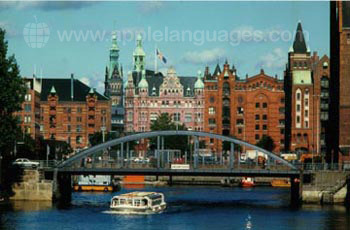 It was good, I learned a lot; of course the language but also about the way of living in Hamburg. The whole thing was just so much fun. It was a lovely experience. 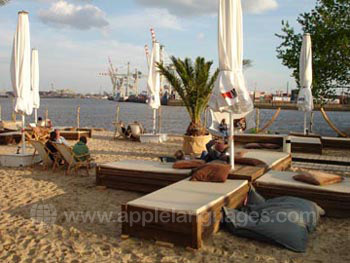 I had excellent accomodation with a host family who lived on the northern edge of Hamburg. 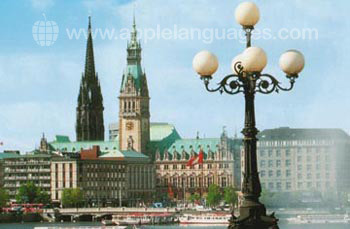 I went to Hamburg for eight weeks to do intermediate German. 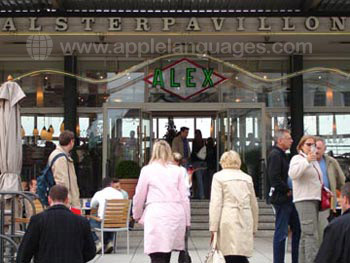 Towards the end of my stay, I found that some native Germans commented upon how well I spoke German. At first I thought that I was being teased because I always have to think carefully before I speak, but no, people were serious. The quality of the teaching at Hamburg is excellent. I thought the course was really great. I learned a lot in the short time I was there. I would have liked to have learned more grammar, but I understand that speaking is also important. My accomodations were wonderful--I could not have asked for anything more. My room was also really clean. The office staff in Hamburg were really great. They were always friendly, and they let me keep my suitcase in the office a week before class started so that I could backpack around Germany. My vacation would have been a pain without their help. I liked the flexibility offered to fit classes around my particular timings. The style of teaching was suitably diverse and well designed for my needs. 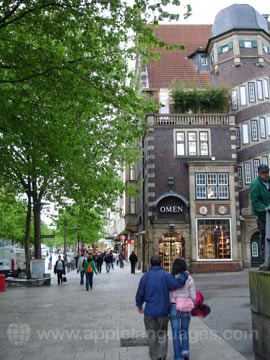 I was very pleased with the progress that I made during my short time in Hamburg. Just a quick note as my course is finishing. It is difficult to imagine how it could have gone any better - every aspect of my month in Hamburg has been excellent. The class size was generally small - for much of the time we had 7-8 people and in the past week 10-11. I had two teachers each morning, which turned out to work really well - each teacher is different so having two people improved my learning. The teaching materials were really good and the pace was good for me too. I have made lots of progress and I will definitely be back: 5 August to 1 September 2017 seems very likely. The accommodation worked out fine too - I wanted a place of my own and that's what the SmartMents [Studio Apartment] provided. It was really handy to have a large bike store in the basement and the laundry room was very useful. There was a good internet connection and the room had plenty of cupboards and plenty of electrical sockets too. Supermarkets were not far and it was handy that the railway station was so close, with its many food stalls and easy connection for my weekend visits away. A really good month - many thanks to you and to the people in Hamburg. 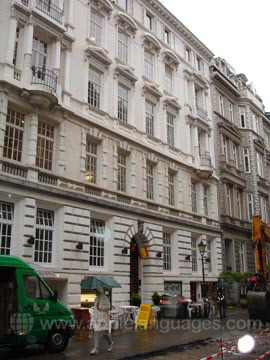 A very good school in the centre of Hamburg. Both teachers I had (Anne-Sophie and Vera) were excellent, and it was also very enjoyable meeting the other students from around the world. I was warmly welcomed by Ute and Hilmo Kepes at their house in Hamburg, I had a very nice room and Ute cooked excellent meals. The course was excellent due to the tuition provided. The accommodation was good although a bit far from the centre of Hamburg. However it was more than adequate for my needs. 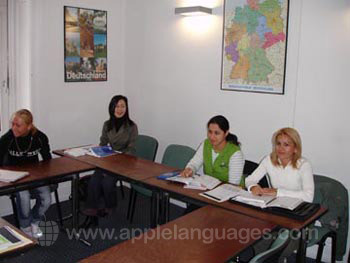 The course was good and it was great that it was all in German. The class size was fine (about 10) allowing for lots of opportunity to talk. I enjoyed it all, the teachers, the host family, the office staff. Everyone was very helpful and friendly. 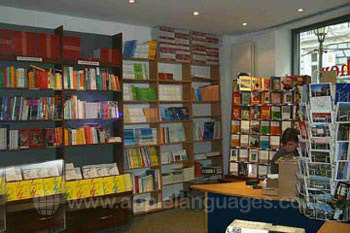 I have already recommended a few friends to contact you for their next language immersion vacation. My host family went above and beyond what they had agreed to do for me. They dealt with my food allergies without a complaint. It was by far an extremely pleasant experience! THANK YOU!!! 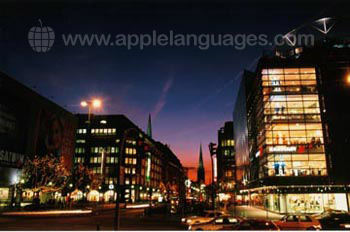 I learned and liked the whole experience so much that I think I might be back next year to continue learning Deutsch. The course was a lot of fun and I enjoyed it very much.The teachers were really nice and the courses were a good combination of theory and practice, especially a bit later on when the teachers focused mainly on talking which was really good. The school is truly an excellent institution, and I felt that every single hour in class was well worth the money paid. I would recommend the school to anyone! The course was excellent, especially the teachers. I thoroughly enjoyed my course, all the teachers were very professional and I will be going back when time allows. My accommodation was very clean and comfortable. Really enjoyed the classes, the teachers were very patient, polite, and thorough throughout the course and I really enjoyed my time there. I had really great teachers during my course - one of them was actually the best teacher I ever had! I enjoyed the school and in particular the first teacher we had. 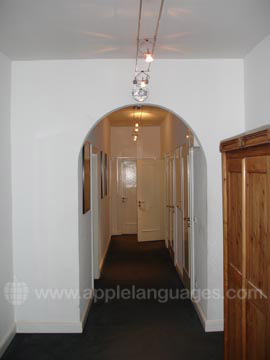 The accommodation was great: my host was very welcoming and spoke lots of german with me. It was quite interesting and well presented. I was lucky to have a 2 very good teachers. I would definitely recommend it. The course was very interesting and stimulating. The teacher was funny and very good to talk to. The school residence was clean and my room was pretty big. 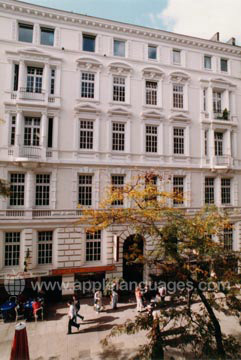 The residence was very good located in the center of the city, so we could walk instead of taking U-Bahn and S-Bahn. Hamburg: my classmates made the local news! 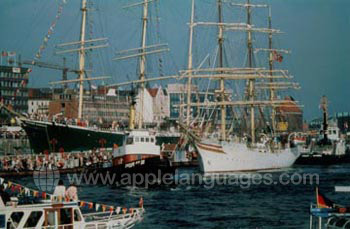 Hamburg is a busy port!